Marathoning For Mortals is a step-by-step (sorry, no pun intended) guide for runners who are ready to attempt their first marathon or half-marathon. Recommended for: Weekend warriors and those attempting their first marathon. 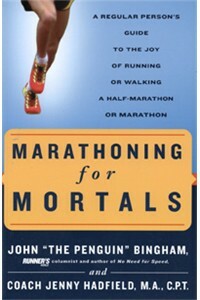 • John Bingham: Regular readers of Runner's World magazine know that John Bingham goes by the nickname "The Penguin", a label that he adopted after seeing a reflection of his running style in a storefront window in his early days of running, back when he weighed 240 lbs. (he has since dropped his weight by 90 lbs...). He stuck with the name, however, and calls his training classes "Penguin Flight School". Besides this book, he is also the author of The Courage to Start: A Guide to Running for Your Life and No Need For Speed: A Beginner's Guide to the Joy of Running. He writes a monthly column for Runner's World magazine. He ran his first marathon at age 43. • Jenny Hadfield, MA, CPT: Like her co-author, Jenny morphed from a non-athlete into a serious marathoner. Despite earning degrees in exercise physiology, she wasn't a regular runner until entering her first race, an 8-K. She subsequently ran dozens of marathons, and ran fast enough to qualify for the Boston Marathon. 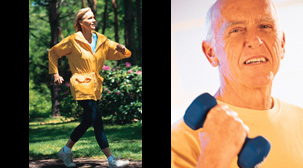 In 1993, she formed the company I Think I Can and began coaching distance runners and walkers. In 1997, she joined Team In Training as a coach. Currently, she is the co-founder of Chicago Endurance Sports, a company that trains new and seasoned walkers, runners, triathletes, and adventure racers. Both authors appear to recall vividly their own personal observations and experiences when they were just getting started in distance running. In fact, Bingham's account of his training plan for his first marathon is simply stunning. It will alert beginners to what can happen to them if they don't train right. As I was reading this book, I kept thinking how much common sense information it contained. For example, all of Part I is devoted to the mental preparation necessary to complete a marathon. It would be easy for athletes-turned-authors to overlook this. One thing that is unique to this book is that, by writing in first person, the authors sometimes engage in a point-counterpoint approach on various topics. For example, when Hadfield talks about how she is inspired during races that have a rural component (eg., Mayor's Midnight Sun Marathon in Anchorage, Alaska), Bingham counters that the best marathon setting for him is a large city, such as the LaSalle Bank Marathon in Chicago. Most training books don't offer this contrast of perspectives, but Marathoning For Mortals does and it's another reason why I like this book. The book is peppered with short vignettes from other novice marathoners. Besides making the book more interesting to read, it may help motivate those who are still ambivalent about tackling a marathon. Each chapter ends with "Know Before You Go", a list of bullet points that reinforces what was discussed in that chapter. At the end of the book are training plans for either walking or running (or a combination of both) a marathon or a half-marathon. They offer plenty of detail, but the layout is clean and organized. Like the rest of the book, it is nicely done. In summary, I really liked this book. Quite simply, this book is fun to read, and, it's a good one on top of that. The authors, despite qualifying as serious marathoners, do an excellent job of communicating at a level that beginning runners need. I recommend it for anyone getting ready to run their first marathon or half-marathon. I think it is much better for that purpose than Runner's World Complete Book of Running.